Der Lavender Circus ist ganz liebevoll dekoriert und gestaltet. Die Mitarbeiter waren sehr nett und haben uns gleich bei Ankunft viele Tipps gegeben. Die Lage vom Hostel ist gut. Die Donau und viele Einkaufsmöglichkeiten sind gleich ums Eck, das jüdische Viertel ist auch nicht weit. Der einzige kleine Minuspunkt: unser Zimmer hatte das Fenster zur sehr befahreneren Straße, wodurch es auch nachts recht laut war. 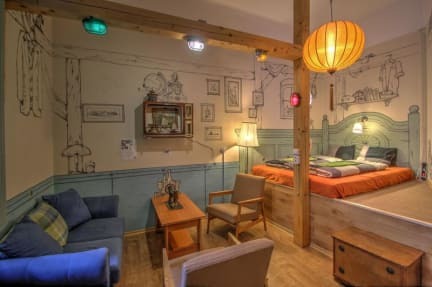 Awesome hostel! Decoration's lovely, gives the place a really nice vibe. The common area is inviting. Staff was really helpful and fun. Got a sample of homemade schnaps, boy that was intense but good! Clean place, comfy beds, nice location. Our stay at the Lavender Circus Hostel was nice. We booked a double room. We had enough space and the room had a cool wall design. It was clean but they left their dirty mop in the bathroom which was a little gross. The house is very old so don't expect too much from the interior. It also was very hot in our room because it doesn't have air conditioning. However, the staff was friendly and it was located near two metro stations which made getting around very easy.